Arts pick: what is the role of the artist? Browse: Home / 2005 / March / 24 / Arts pick: what is the role of the artist? Today’s art’s pick questions the role of the artist in our society. The symbolism–namely the palette and the sword–is straightforward and represents the subject’s uncertainty and turmoil. This figure, an artist himself, faces a difficult decision: should he use his skill to create beauty, or should he wield his talent like a sword, using it to destroy the flimsy facade of a material society immersed in shallow pop culture? The simplistic, good-versus-evil color scheme used to craft this image belies its underlying ambiguity. Not only is the role of the artist uncertain, but so is the role of the viewer. As we gaze at the painting, the smiling figure gazes back, perhaps assessing us as potential subject material and silently alluding to an impending role reversal. The mood of confusion and uncertainty is further underscored by the imprecise medium and painting technique. Overall, this work of art, on display at Philadelphia’s Yard’s Brewery, is a valiant exploration of the artist’s psyche. Recommended. Maybe the mood of “confusion and uncertainty” is brought about by the most difficult question – which Yard’s to drink?? Mmmmm – tavern ale. Is it to early to have a drink? What does the hat mean? I want to know what happen to the ants? I miss them already. I thought the ants freaked you out? What about some crutches supporting a phallic object or two? I’m glad the ants are gone, myself. They sort of made the place look messy — like you’d spilled sugar everywhere, or dropped some cookies behind the couch or something. Well, the ants may have freaked me out, but now that they are gone I miss them terribly. Ah well, as long as you are happy, happy I won’t complain. Much. the palette also functions as a shield for the artist. it protects him from painful interactions. letting him function as a documentarian rather than participant. and I think the hat symbolizes the different hats the artist must wear. he must be an artist, yes, but he must also be a “proper” businessman if he is to make a living from his work. I think he’s just auditioning for Spamalot…. Are you guys sure that it is a palette? It kinda looks like a giant chocolate chip cookie which might explain the smile. I think the hat means he is Amish. 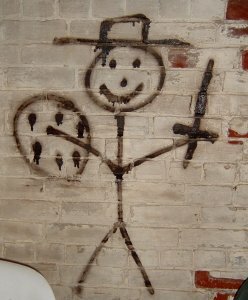 A cookie eating Amish swordfighter which means there was no deep meaning from the artist other than the fact he/she was drunk. It is at a brewery afterall. He looks like a roleplaying character from Kingdom of Loathing. Don’t ask me how I know that. No, really, don’t ask. (KOL is a joke, a takeoff on MMORPGs, you should check it out). It reminds me of Picassoâ€™s image of Don Quixote. And why shouldnâ€™t a sword wielding runaround seducer be an apropos image for a tavern? to write of “the simplistic, good-versus-evil color scheme” is to turn away from the other possible (non-ethical) polarizations that such a ‘contrast’ might produce/maintain. ‘Simple’ must here be understood as ‘immediate’, and our mediation is not a strict either/or unless directed that way. I am fond of the postee that recognised the similarity between Picasso’s ‘Don Quixote’ (a particular favourite of mine) and the above image – is it that the artist’s ‘role in society’ is mere naivety and imitation? Can this be read as an assault on, rather than a supporting of, such a characterisation? Yes, it can – alongside many other ‘readings’. Or perhaps it simply begins the naive ‘asking why’ that we all seem so willing to engage in . . .
Is the role of the artist seen in his artwork?